February 6, 2017 (DALLAS, TX) – Boxer Property is pleased to announce it has concluded lease renewal negotiations with Centene Corporation, a national healthcare service provider based in Clayton, Missouri. 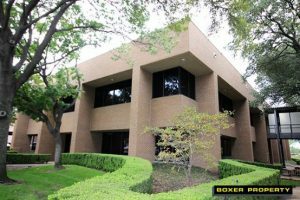 As a valued Boxer Property tenant, Centene will retain their office space located at both properties, 4000 N & S McEwen Road, for a total of 46,769 square feet in the Farmers Branch, TX . Alexander Renwick, Senior Broker for Boxer Property, represented the landlord during negotiations while Cushman & Wakefield represented the tenant. Located in the Farmers Branch area of Dallas, 4000 N & S McEwen Road features a total of 46,769 square feet of office space. The two low-rise properties are a part of a professional office building campus also known as The Centre. The pair of properties feature beautiful landscaping, nearby walking trails, and a spring-fed lake with outdoor seating. Tenants will enjoy the myriad of available amenities including on-site maintenance and management, security with key card access, abundant parking, conference rooms, and a health club located on campus. The area offers many dining options including Saltgrass Steakhouse, Grand Lux Café, Del Frisco’s, and Starbucks. Travelling for business is convenient with an office location at 4000 N & S McEwen Road, as Love Field and DFW International Airport are approximately 10-15 minutes away. Centene Corporation is a national healthcare enterprise based in Clayton, Missouri. Founded in 1984, the Fortune 500 Company has established itself as a nationwide leader in the healthcare services industry. Centene provides a variety of services to government healthcare programs and specialty services. Committed to providing their services on a local level, Centene emphasizes the importance of servicing within the community to deliver quality healthcare.